The M3 OPAC is the patron's gateway to your library's collection. Searching your collection for books, magazines, e-books, websites, maps, CD-ROM's, full text articles, and more is simple using the M3 OPAC. If your library system utilizes a Union Catalog, not only can patrons search your local catalog, but they can also search additional sites on the system. From the Databases tab, patrons can select and search any site as though they were in those libraries! Standard Search allows patrons to enter subject, title or author keywords when searching the collection or online resource. The number of results returned displays at the bottom of the screen. If patrons do not locate what they are looking for, or their search is too broad, they may then browse either the subject, title, or author indexes. To assist patrons with narrowing search results, the Standard Search supports the AND, OR, and NOT Boolean operators as well as truncation searches (*), wildcard searches (? ), and phrase searches ("). The Enhanced Search supports the same useful functionality of the Standard Search as well as additional search field selections. In addition to searching by subject, title, or author, the Enhanced Search allows patrons to search MARC fields such as Date of Publication, Material Type, URL, Title Series, and Abstract/Summary from a drop-down menu. Librarians also have the ability to add or delete search fields, thereby customizing this search interface for your library's audience. The Visual Catalog provides a graphical search alternative. By selecting pertinent graphical buttons, patrons narrow their search utilizing a topic tree approach until specific results are displayed. 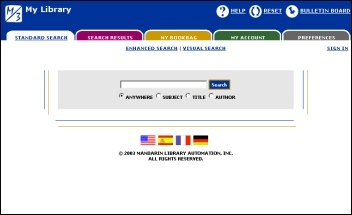 Librarians may easily customize the Visual Catalog highlighting holidays, e-books, electronic databases, websites, activities, bestseller lists, Accelerated Reading Lists, New Resources, etc. Librarians can even select to launch applications such as WordPad, Excel, Encyclopedia, Atlases, etc. from the Visual Catalog screen. The OPAC enables you to select topics and appropriate graphic images. Mandarin provides over 60 graphics with the software. You may also choose to design your own graphics and add them to the Visual Catalog. The Search Results window is designed to display results in an organized and easily readable format. Each title is displayed with availability, material type, bibliographic information and call number information. The librarian can customize these display defaults as well as define the default font and font size of the Search Results list. If your library has the new Authority Control Optional Module, "See" and “See also" cross-references are displayed at the top of the results list. These cross references lead patrons to subjects related to their search. The Bulletin Board keeps your patrons informed of your library's hours of operation, holidays, or special events by linking to your home page, any Web page or document you want patrons to view.